Following on from yesterday where I mentioned the possibilities of moving house - today my partner finalised the details and the move date is set for 20th December. Less than a week before Christmas which I'm sure will prove to be a challenge. Hopefully winter conditions will be practical and we won't be in the midst of a blizzard. I just have a feeling that there will be snow everywhere and we'll be trying to manoeuvre the streets like Midtown Madness. She is full of excitement but I know from experience that it's not as easy as it may seem. This evening I was delayed by the trains which led to collecting my children later than I should have which was annoying. Especially as the objective for the evening was assignments for my son with the aim being to build his confidence in writing. He was reluctant at first but I made it enjoyable and soon he was copying words from everywhere he could see them around the room. My daughter who still hasn't fully recovered from last week so has doctors tomorrow, he should prescribe something to get her back to her usual self. Finally this evening I decided to blow the dust from my Xbox 360 console and update to the New Xbox Experience. The update took around ten minutes to complete overall and once it had finished I signed in and created an Avatar. 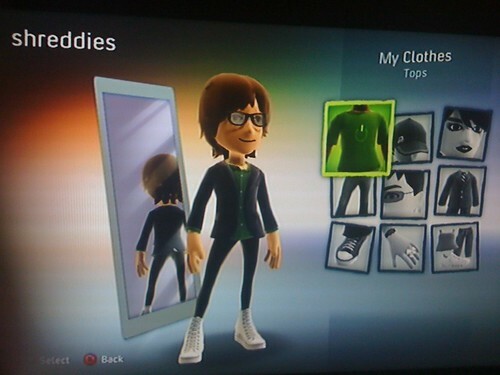 Above is my character and how I am portrayed on the Xbox Live service although I reckon my legs are possibly a more skinnier!